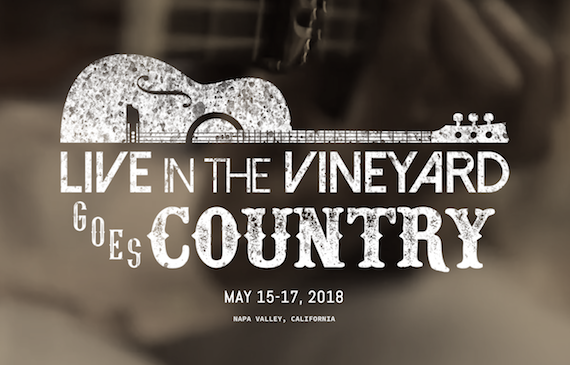 Live In The Vineyard, the private music festival held annually in Napa Valley, is partnering with the Academy of Country Music for the inaugural Live In The Vineyard Goes Country. Taking place May 15-17, it will give attendees exclusive performances and access to top tier wine makers and world-renowned chefs. There will be a headlining performance by Carrie Underwood and acoustic performances by Hunter Hayes, Old Dominion, Parmalee, Ashley McBryde, Jerrod Niemann, Maddie & Tae, Eric Paslay, Maggie Rose, Lindsay Ell, Mitchell Tenpenny, Cale Dodds and Cash Campbell. The Opening Reception on Tuesday, May 15 will feature Old Dominion and Mitchell Tenpenny. On Wednesday, May 16 Live In The Vineyard Goes Country attendees will enjoy a Nashville style in-the-round guitar pull featuring Maddie & Tae, Jerrod Niemann, Eric Paslay and Cale Dodds at Regusci Winery. That evening, superstar Carrie Underwood will headline the main event at the Blue Note Napa. The all-star Wednesday night line-up will also feature Hunter Hayes, Parmalee and Ashley McBryde. To round out Live In The Vineyard Goes Country, there will be a send off brunch on Thursday, May 17 with acoustic performances by Maggie Rose and Lindsay Ell. The VIP event will feature Cash Campbell. Fans can check out more information about Live In The Vineyard Goes Country and enter for a chance to attend at www.liveinthevineyardgoescountry.com, as well as enter to win onsite in Las Vegas at select ACM Party for a Cause events April 12-15, leading up to the 53rd Academy of Country Music Awards™ on Sunday, April 15. Tickets are available through special radio station promotions with iHeart Radio, Cumulus, Entercom, Westwood One, the Bobby Bones Show, local participating stations, as well as exclusive sweepstakes and offerings with official airline partner, Southwest Airlines.